Bioroids and Bombots: LLW: Water Cannon and Brine Throwers. LLW: Water Cannon and Brine Throwers. The only GURPS stats for a water cannon that I can find are in GURPS Vehicles 3e (p.118) and these omit certain criteria that one might wish to know. The table below attempts to adapt those rules to TS 4e. 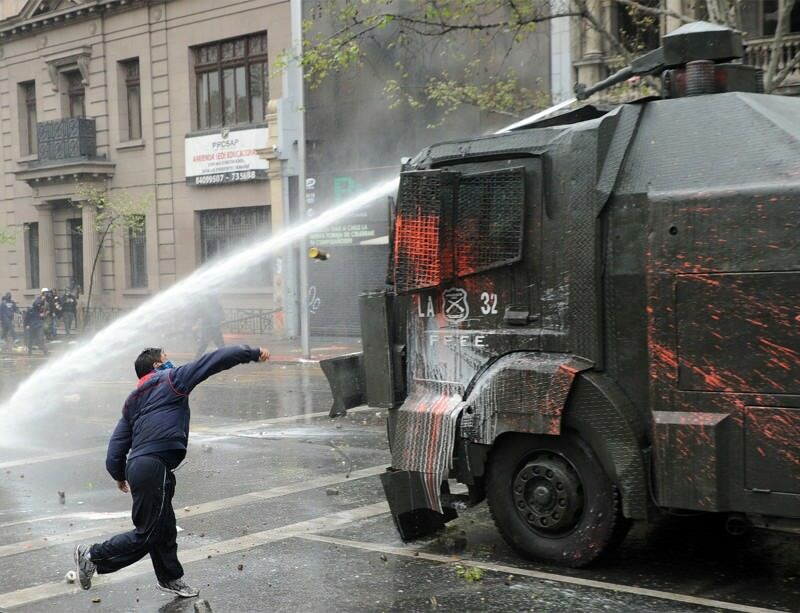 It is assumed that the water cannon is mounted on a suitable vehicle. Being intended for TS this system is a little lighter than those of earlier TLs. Total weight of a system is dependent on the reservoir capacity, maximum number of shots being represented by “S”. Volume of the reservoir tank can be taken to be S x 0.08 cf. Each shot of liquid weighs 4.25 lbs. A single, totally filled, 100 shot small water cannon therefore weighs 20+25+425 = 470 lbs and has an 8 cf tank. A reservoir tank may supply more than one projector. Each additional projector weighs 20lbs if small, 40lbs if medium and 80lbs if large. A water cannon is treated as a jet (4e p.B106) but using the 1/2D and Max ranges given on the table. It does no damage and instead has a knockback effect. It does the equivalent of up to 4d damage for calculating knockback. Knockback rules are for every full multiple of the target’s ST-2 rolled, move the target one hex away from the water cannon. A target that has no ST or is not resisting uses HP instead (4e p.B378). Knockback into something hard may cause actual damage. (GURPS Vehicles 3e suggests 1d per 2.5 hex of knockback). Potentially a water cannon can have dyes, irritants or malodorants added to the water. Some versions have a separate reservoir allowing the operator to only use additives when desired. In practice such additives are seldom used since their use in a water cannon can result in a major clean-up problem! The availability of compact, efficient refrigeration units allowed the development of a variant known as a brine-thrower. The addition of additives such as salt to the water allows it to remain liquid when chilled to below normal freezing point. Treat as a normal water cannon but with a follow-on effect similar to being immersed in arctic seawater. Every minute roll against health or lose 1 FP. Normal clothing, including winter clothing provides no defence. A diver’s drysuit, high levels of cold tolerance or something water-tight such as a battle-suit may provide some protection.